With our own food supply so corrupted with over-processing GM ingredients & syrup sweeteners, there is no doubt that our animal’s food supply is the same (and probably worse). While I’m all for giving treats to your loving equine, but it’s important to make sure you are feeding them clean. The best way to do that is to make treats yourself (psst, it may even save you money). I scoured the web to find as many treat recipes I could, luckily I’m not the first to write about this so I was able to find some fantastic lists. Some of the recipes call for peppermints & other candy. Yuck, you should avoid feeding processed candy to your horse. 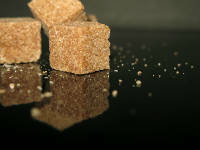 Be sure to also use organic and GM-free ingredients wherever possible for the best flavor & the highest health benefits. Preheat oven to 350 degrees. Mix carrot, apple, corn oil, and molasses together. Fold in salt, oats and flour until well mixed. Spread dough out in one piece on greased cookie sheet. Bake for 20 minutes till golden brown. Let cool and break into pieces and serve. My Equine Source has a whole category dedicated to treat recipes. This recipe was submitted to Moniteau Saddle Club by Leah in Ohio. Cut the carrots into very slim sticks. Stick them into the grapes. Put the grapes in ice cube trays (each grape in an ice cube spot). Put them into the freezer. Leave them in the freezer for however long you want, if you want them cold but kind of mushy, do a couple hours. If you want them frozen solid, put them in for a day or two. If you are having a little trouble popping them out of the tray, run a little warm water over them. This recipe is from over at Carolina Horse and Hound and they have a great list of recipes that include dog treats too. Preheat oven to 400 degrees & mix together all ingredients, except powdered sugar. Form into large balls and press flat onto greased cookie sheet. Bake for 20 minutes, cool, then sprinkle with powdered sugar. This recipe from Front Range Frenzy and is one of many on their recipes page. In a huge bowl combine the sweet feed, bran, oats, apple juice, carrots, apples, raisins, molasses, corn syrup, applesauce, corn oil, and baking powder. Add flour and water, alternating until you have a cake like batter that is very chunky. Spray muffin tins with an oil and drop by spoonfuls. They will rise a little, so don’t overfill. Bake at 350º for 10-15 minutes. Cool on a paper towel. Or you may pour batter into a large baking pan (well-greased!) to make cookie bars. Bake until center is dry and firm (probably 30-60 minutes, depending on your pan and amount of batter). Let cool overnight. Cut into squares. This makes a huge amount. Preheat oven to 350º. Generously grease a cake pan and set aside. 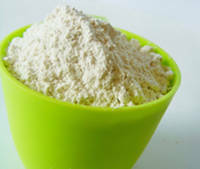 In a large bowl, mix corn meal, two cups of the sweet feed, bran, flour, and salt. In a separate bowl, mix applesauce, baking powder, molasses, and water, then fold into the dry mixture. Mix thoroughly. 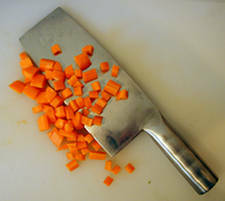 Peel carrots into thin strips with a potato peeler. Add to the mixture. The mixture will be very heavy and somewhat dry. Press dough into a greased cake pan. Sprinkle remaining cup of sweet feed on top and press lightly into dough. Bake for 30 minutes. The two recipes above come from perhaps the most comprehensive list of treat recipes I could find on a rather small little site. Thanks to everyone who posted their recipes & if any of you have a great one to share, lets hear it! If you simply don’t have the time to create homemade treats, check out this great list of organic feed & treat brands. This entry was posted in Horse Basics on July 6, 2010 by The Equinest. Most of you might know about this book. The Original Book of Horse Treats. 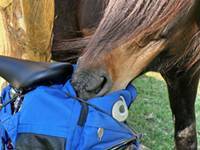 Recipes you can make at home for your horse. Hors(e)d’Oeuvres, Salads, Snacks, Bran Mashes, Desserts, Natural Remedies and Treatments, and more. 4 sugar cubes, 1 sliced apple, etc. You can mix this in your horse’s feed bucket. Mix the oatmeal with the water, add sweet feed and applesauce, stir together. Add cherrios, brown sugar, and honey/molasses. Mix again and place treat on top. Serves 1 horse. Chop the apples and carrots. Make crumbs of the rice cake and mix all the in ingredents. Distribute the mixture over the bread and serve immediately. These are FABULOUS! I’m putting up a link on my blog to send folks here. Thanks! yw & thanks for posting about it. Preheat oven for 350 degrees F. First, mix sugar, flour, and crushed/grated goods. Then add liquid goods. Stir until well blended. The mix should be sticky, but not too runny. If it is too runny, add flour, if it is to thick, add a little more molasses and oil. Cook for 10-15 min. Apply more time if it’s necessary. They should be crunchy when you are done, let cool in fridge. My horse loves em’ after she gets a good workout on the jump course! my horses loved these treats! when i made them though i had shaped them into little cubes and once they went in the oven they turned into a cake! dont spend to much extra time with shaping the treats they just turn int a cake!! i then just cut them into squares. i also found that they needed about 20 minutes or more to fully cook. The horses at my stable looove the easy horse treats! My horse is IR, any suggestions for low/no sugar homemade treats? Whisk these together in a large bowl. Add 1/2 cup unsweetened applesauce and two cups HOT water — mix everything together with a rubber spatula. You can also knead it with your hands to thoroughly mix all ingredients. Grease a cookie sheet and coat it with flour. Put the mixture on the cookie sheet and press it all the way out to the sides (use the rubber spatula — it is easier than using your fingers) in a uniform thickness. Cut into horse treat sizes before baking (makes it easier to break apart afterwards). Bake in a 350 F oven for 75 minutes; turn the oven off and leave the treats in for 30 more minutes (longer if you want crunchy treats). Cool completely and break into horse treats. Low starch, low sugar. All the horses at our barn love, love, love this cookies!! I see lots of recipes with oats. 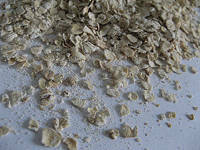 Is that quick oats or regular rolled oats? I tried making the “Sweet Feed Horse Cookies.” I thought 3 cups of molasses was way too much for 4 cups of sweet feed, so I reduced it to 1 1/2 cups of molasses. Sadly, they still didn’t turn out right. They were a sticky gooy mess, even after baking for an additional hour on 200 degrees to try to dry them out. I’m going to have to throw the whole mess out. I don’t know what I did wrong! Did you run the sweet feed through a mill or something to make a flour out of it? I used straight sweet feed. The picture next to the recipe doesn’t even look like it has sweet feed in it and 3 cups of molasses would have made the cookies very very dark. If you put your mouse on the Sweet Feed treats it says Brown Sugar HELP ME THIS MAKES NO SENSE!!!!!!!!!!!!!!!! Im pretty sure horses cannot have milk….